Welcome to the UKMums.tv Teletubbies toys takeover! Welcome to a very special takeover featuring every young pre-schoolers favourite cuddly characters – Teletubbies! The Teletubbies may show no signs of age – but now the toy collection is going to reach younger audience than ever before and this week we’ll reveal why with a rundown of the brand new range of Early Play toys from Character Options. 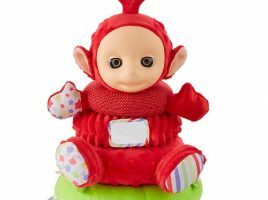 These feature-packed, super soft multi-sensory toys have been designed with babies and younger children in mind, giving them the opportunity to learn through play with their first favourite TV characters – the Teletubbies. We’ll also have a fantastic competition for you to enter, a Twitter frenzy, free downloads and more. So keep checking back and say ‘eh oh’ on social media too – follow @UKMumsTV on Twitter and like us on Facebook. Oh, and don’t forget, you can watch Teletubbies episodes on the iPlayer, Amazon Prime and CBeebies! 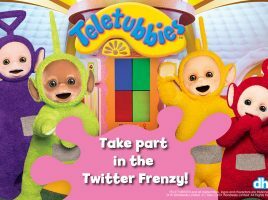 Join the Teletubbies Twitter Frenzy! How to use everyday items in the home to aid your child’s development – and have fun at the same time! FREE Teletubbies activity sheets to download! The Teletubbies takeover continues with free activity sheets to download for your little ones. Read on to find out how. Look who’s new in the Early Play toybox!